Thanks to Mike C for the ad! If any MM site readers are on the ground near either one of these, let me know. more details/info can be ascertained from 4/30/2010 ADW ad, level III(3). whoch should have been done near 5/1/2013 are done - with additional information only to be gathered by "those in the know"
from "cf. Bayesian summation:[ether}}" and reference to "Hotel California" and 1/16/91 ADW ad, level II(2). and Revelation chapter 19 verse 2 - a wish that "just" punishment can be delivered to he PDs "statim" (immediately). medication for it and doing better. the 4 levels of communication within this ad? "Uzamcolo" is Zulu for "deluge," "flood," or "inundation." So, it's fair to assume this is a biblical reference to THE flood. The 483rd anniversary of the Confessio Augustana was June 25, 2013 - coincidentally, the 63rd anniversary of the start of the Korean War in 1950. Square: http://goo.gl/maps/H7yxl Eight Harvard presidents are buried there, as well as several notable political and artistic figures. Haven are named after the men (Dixwell Ave., Whalley Ave., Goffe St.). 1/16/91 was the beginning of the first Gulf War. presence of God after ascending Mount Sinai to receive the Torah. 5/22/13 would be the 3,325th anniversary of that event. corrupt the earth with her fornication, and hath avenged the blood of his servants at her hand." for the treatment of erosive esophagitis. 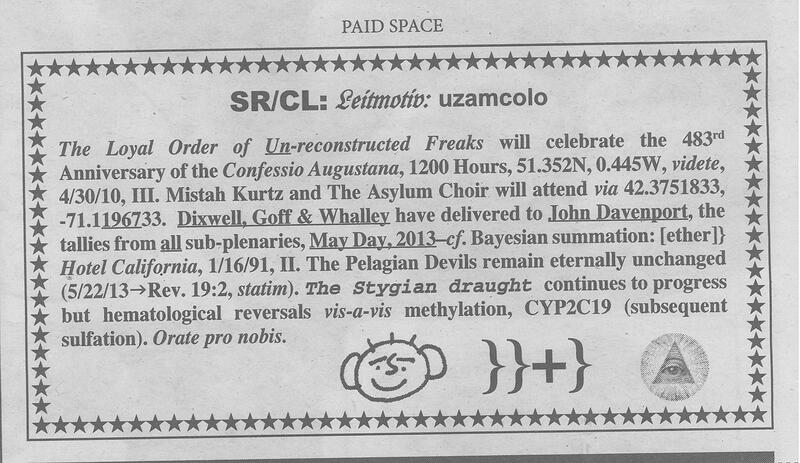 The May 2012 ad also mentions CYP2C19 but uses different notation (Cytochrome P450 2C19). Ok. So don't quote me on any of this, because I used Google, but here's what I've found so far. SR/CL (at the top) is the abbreviation for Stericycle Inc. I found a link to its stock chart. I would say maybe find the May charts for it? I'm not sure what it means. 2. A dominant and recurring theme, as in a novel. something that is hidden within the documents that are similar, not the obvious place and date of the articles. compound as a compound has been placed further down the page, if previous posters are correct. It could also be a reference to the heavens, as that would follow the theme of biblical references. Hematology is the study of blood, blood cells, etc. Methylation is the addition of methyl to substances. I didn't have time to research very far into it, but it seems important in science. Comments: Go to the place where the letter is desribing on the date the letter describes! If you look hard enough, you'll find most times that the all-seeing-eye is connected to the Illuminati. the closest house name is "Treetops". And it's a pricey house... about 12 million pounds. Confessions (given in Ausberg, Germany) was one of the most important moments of the Lutheran Reformation (recurring theme). location on June 25th at noon! Per Google Maps it is a location called "Old Burying Grounds" and no surprise, it's a very old cemetery. Christ Church built in 1760.
and I take note that Davenport (affiliated with Yale) is noted in the Announcement... perhaps a coincidence. symbolize "john davenport"? davenport founded yale university and yale's davenport college is named after him. death of king charles, but fled to new haven, connecticut where they were housed & protected by rev. john davenport. is  for all its effort, irrelevant to seeing the cleverly disguised invitation to meet at a cheap hotel room number? this is odd to say the least. SR/CL as stated by another poster is (probably) Stericycle Inc, a medical waste disposal company. references to musical scores and songs. uzamcolo means flood or deluge in Zulu. pathway for a treatment of cancer (hematological malignancy). "Cancer" seems to be the common topic for each of these chemistry/medical terms. hematological malignancy). Could "unreconstructed freaks" refer to people with cancer or cancer-like conditions that have yet to be cured? Comments: 'the stygian draught continues to progress' - 'stygian' can be interpreted as 'hellish' or 'infernal' and a draught generally signifies a lack of something, a lack of progress or information maybe? hematoloy is the study of blood, the blood-forming organs, and blood diseases. this information may be detailing a promising end to the 'stygian draught' mentioned earlier? this idea is reinforced by the last phrase 'orate pro nobis' - pray for us (i.e. wish us luck) and the title of the advert;'leitmotiv(dominate theme) uzamcolo'(downpour)- the 'downpour' signifying the end of the 'draught'. 'the stygian draught continues to progress' - 'stygian' can be interpreted as 'hellish' or 'infernal' and a draught generally signifies a lack of something, a lack of progress or information maybe? Okay, this might sound crazy but there are stars all over as a frame and the stars usually symbolise power,honour, achievement and hope. Another link: The five-pointed red star (a pentagram without the inner pentagon) is a symbol of Communism and Socialism and represents the five fingers of the worker's hand, as well as the five continents (as traditionally counted). If the collinear edges of a regular six-pointed star are connected, so that two interlaced triangles are formed, a symbol results that is variously known as the hexagram, Star of David, or Shield of David. The six-points represent all twelve patriarchs or tribes. The two "Triangles" are actually the letters "Dalet" and "Yud", the two letters assigned to Judah. The two triangles form a diamond, which is the gem assigned to Judah. The Arabic star is a punctuation mark developed to be distinct from the asterisk. The asterisk had existed in feudal times, and the original shape of the asterisk was six-pointed, each point like a teardrop coming from the center. Also there is a pyramid with an eye on the middle that is seen on every US dollar and most of the media i.e. music videos, tv, ads, etc. It has a lot of references and depict power, "watching you", upper hiearchy, etc. it is formally called Eye of Providence as you must be aware of. "The simple fact is that the eye in the pyramid is not now nor has it ever been a Masonic symbol. The 'Eye of Providence', sometimes referred to in Masonic ritual as the "All-Seeing Eye" (of Deity) is found in the ritual of most jurisdictions, reminding a Mason that his words and deeds are being judged by the Supreme Architect of the Universe. The pyramid appears in the ritual of some (not all) jurisdictions and represents the great builders of the past. However, their combined usage is essentially non-existent except by a few fanciful representations done by individuals whose imagination has soared beyond that of the black text ritual. There is NO 'official' combination of the eye and the/a pyramid! The infrequency of the combined eye/pyramid usage was much more clear to this site's author when, in preparation for this page, we looked for a single example of an emblem or other "Masonic" eye in a pyramid. we couldn't find one! Nearly three years after this page was first written and after hundreds of thousands of 'hits', we've been provided with only two examples which might be an eye in a pyramid (although arguably, it could just as readily be an eye in a triangle)." It also goes all the way back to  Egyptian mythology and the Eye of Horus. "Buddhist texts like the Mahaparinibbana Sutta also refer to Buddha as the "Eye of the World" (although no imagery is used). It is frequently used to depict the image of God in Caodaism. In Medieval and Renaissance European iconography, the Eye (often with the addition of an enclosing triangle) was an explicit image of the Christian Trinity. Seventeenth-century depictions of the Eye of Providence sometimes show it surrounded by clouds or sunbursts." power that they use, of course, the illuminatti might be fond of them. Or even the other way around. I also reckon that one of the Rosthchilds have collaborated with them, or perhaps started the whole thing. (?) I need to dig in and get more knowledge about it though. I don't remember what else I wanted to write, ugh..
Could Un-reconstructed refer to an anagram within the message? as you may say) is controlling the May Day newspaper now." The Orphanage once wrote to Bryan that they consider the Illuminati as an unoffensive "club of gentlemen"
to the big flood in the leitmotiv, Genesis might be a good place to start. govern the night. He also made the stars." then nothing they plan to do will be impossible for them.'" treated me,' he burned with anger." I'm not as intimately familiar with the MM as others - do any of these strike any significance? How and Where Are Genes Methylated?